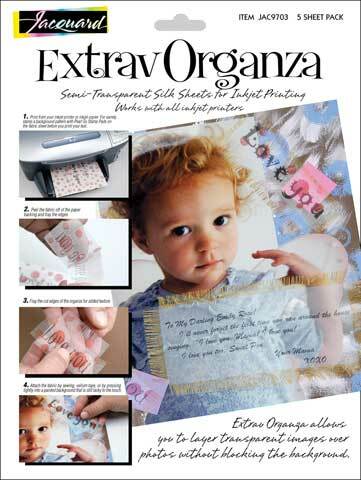 ExtravOrganza is a semi-transparent silk organza fabric measuring 8-1/2" x 11" and backed with paper to easily run through a desktop inkjet printer or inkjet copier. Easy to use - simply print, peel and attach to artwork. The printed image or text can be layered over photos or artwork without blocking the background. Available in a 5-sheet pack.